Most Chronic Kidney Disease and Dialysis patients realize that an infection occurs when harmful bacteria or viruses enter the body. However, many will be surprised to learn that the annual death rate due to infections is a whopping 100 to 300-times higher in Dialysis patients compared to the general population. 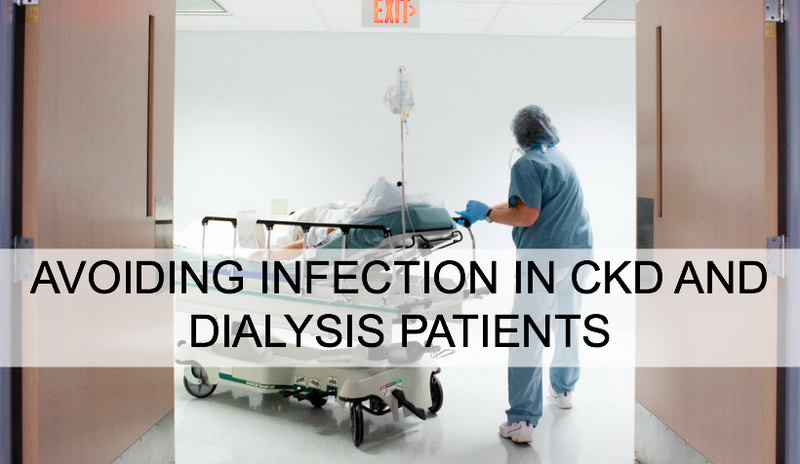 What's more, infections are the second leading cause of death among Chronic Kidney Disease patients conducting Dialysis, following Cardiovascular (relating to the heart and blood vessels) Events. In fact, death risk from Cardiovascular Events significantly increases after hospitalization due to infection. While Chronic Kidney Disease and Dialysis patients do their very best to stay as healthy as possible, one accidental infection could lead to a major setback, cost a patient his/her chance at a Kidney Transplant, reduce the opportunity to take part in breakthrough treatments such as the Artificial Implantable Kidney, and can even lead to death. The following are tailored tips for Chronic Kidney Disease and Dialysis patients to avoid infections. Wear your Dialysis Arm Sleeve - The KidneyBuzz.com Dialysis Arm Sleeve is a tailored pull-over sleeve that conforms to a Dialysis Patient's AV Fistula Arm (not tight due to a blended material) and helps to protect against accidental infections caused by a patient's arm touching contaminated surfaces (get your sleeve by clicking here). 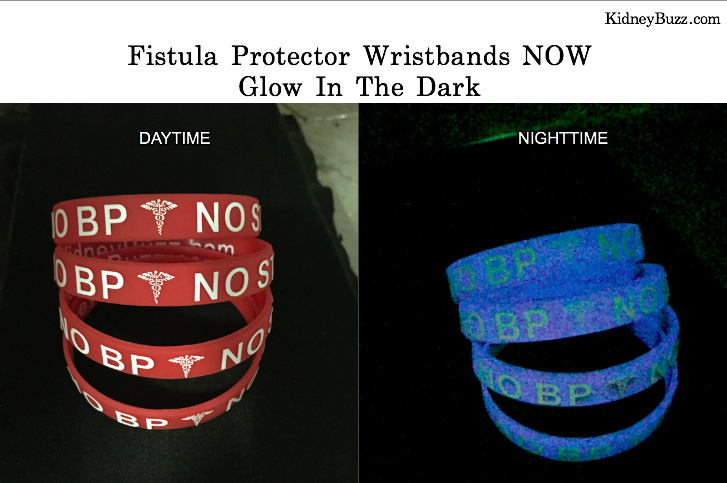 Most patients come into contact with surface contamination daily (hugging loved ones, public bathrooms, kitchen counter-tops, public transportation, restaurants, etc) without even realizing it, which puts their AV Fistula or Graft at risk of infection. The Sleeve also prevents thickening of scabs to reduce needle stick pain, bleed-outs, and covers the fistula to hide scars and bulges. Keep your access site clean - Make sure that you wash your hands before touching your AV Fistual, Graft, Chest Catheter or PD Catheter. Talk with your Nephrologist on how to best clean the areas periodically. However, most patients may consider whipping their sites with an alcohol swab with clean hands once or twice a day just to make sure that it remains sterile. Also, remind your Patient Care Technicians, caretakers and loved ones to wash their hands before handling your catheter or access to avoid the spread of germs. Look for signs of infection - Inflammation and fever are clear signs of infection. Other signs include redness around an infected area of the body, irritation, bleeding, and pus (a whitish-yellow, yellow, or brown-yellow protein-rich fluid that accumulates at the site of an infection). People on Dialysis should clean their access site before treatment. Infections to an access site can spread rapidly through the body, complicating your treatment and delaying your recovery time. Any signs of tenderness or irritation should be reported to your Nurse and Nephrologist. Don't skip Dialysis if you can avoid it - Do your best to make every Dialysis Treatment. Missing dialysis means waste and toxins build up in your bloodstream, leaving you weak, ill and prone to infection. If you have any concerns about your diet or medication, talk to your doctor. Eat well - Make sure that you are working with your Dietian regularly to create an eating plan based on your individual nutrition needs. Consuming adequate amounts of protein, calories and nutrients build your body’s immune system. Try not to skip meals. Instead, try some of the hundreds of FREE KidneyBuzz.com Impact Meals that are tailored for the Renal and Diabetic diets while ensuring rich flavor and exceptional taste for Chronic Kidney Disease and Dialysis patients (click here). How do you avoid infections? Weigh-in with your own pros and cons at the KidneyBuzz.com Facebook Fan Page which has over 68,000 friends (click here). While you are there, like the KidneyBuzz.com Facebook Fan Page and visit KidneyBuzz.com regularly (approximately 250,000 monthly viewers) for the latest tailored breaking news and information which teaches those with Chronic Kidney Disease, on Dialysis, have Kidney Transplant, Diabetes, and High Blood Pressure how to better manage and improve their lives. You may become a regular visitor like, Tom Johnson who said, "Kidney Buzz is the best source of information for any patient that suffers from kidney disease. I'm happy that I found the advertisement for the Kidney Buzz warning bracelet that put me in touch. Thank you for all that you do."